Scotland, especially in the Scottish Highlands and Island have a unique land ownership system called a croft, where people are in a partnership with the crofting commission who technically own the land, while the “tenants” have an inheritable right to pass on or sell the right to live and farm the land. 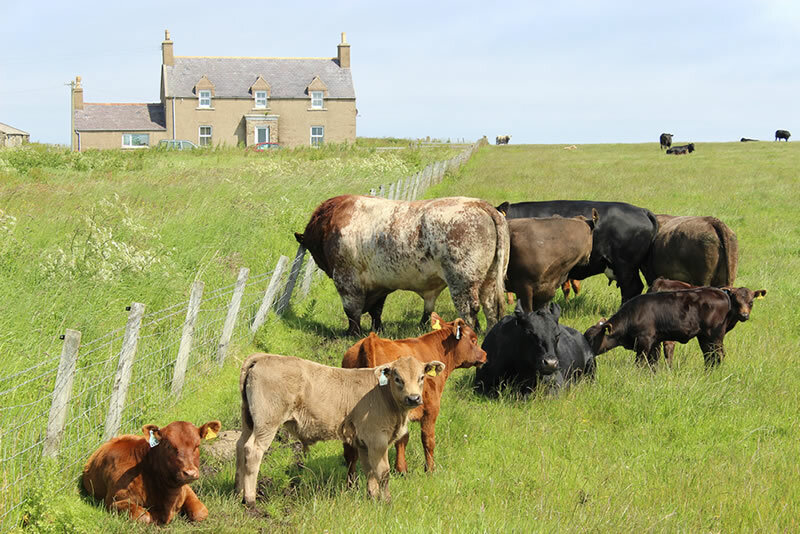 While in reality the cost of buying a croft is not much less than buying privately owned land, a croft comes with many benefits for the “owners” in that they can get grants towards land and property improvements from the crofters commission. 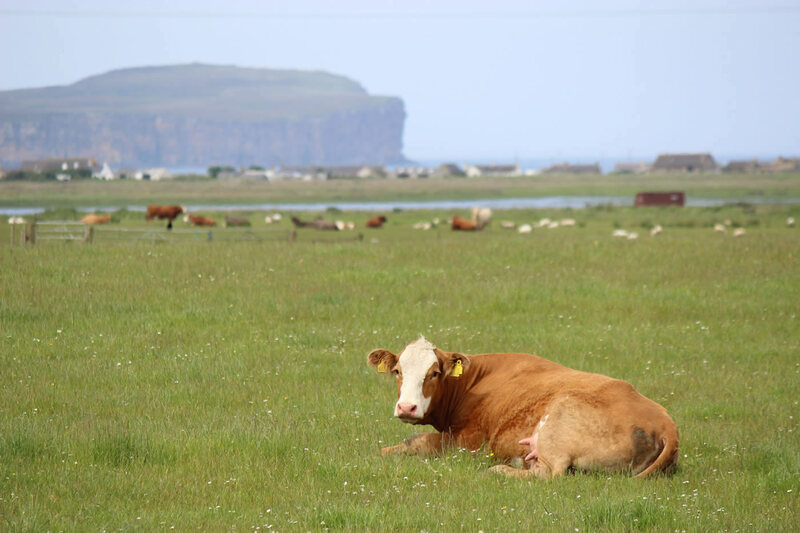 Picture of a typical farm / croft in the county of Caithness with pictures of cattle grazing on lush grass fields near the coast at Scarfskerry. The crofting system as we now know it came into being over a 100 years ago, with the the Crofters' Holdings Act of 1886, aimed to help people get access to land to farm while assisting with property and land improvements this enabled many, often poor people, and soldiers coming back from World War I and II to get a place to live, and a farm to work. In the past most crofters lived in houses, or crofts, that were legally part of the croft. Today most croft properties are now on parcels of land that have been de-crofted so that people can buy these properties with a mortgage just like any other home. Houses legally called a croft and that are on land that has not been de-crofted are not eligible for mortgages, although loans can be taken out to buy the land and property. We live on a very small croft, the house is on a parcel of land that has been de-crofted and the land, around 1.2 acres is croft land. Over the 10 years we have lived on our small croft we have never asked for grants for improvements to the land – having no commercial ambitions with such a small piece of land we have focused on improving the area by planting over 450 trees (as small whips, plants that are 2-3 years old grown from seed or cuttings by a commercial nursery) to encourage wildlife, insects, bats and birds. 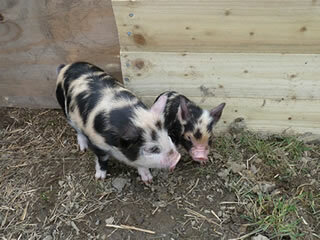 We have added hundreds of metres of fencing to protect our live stock that consists of ducks, chickens and Kunekune pigs. All our animals are kept as pets, although the odd cockerel has ended up in the pot. 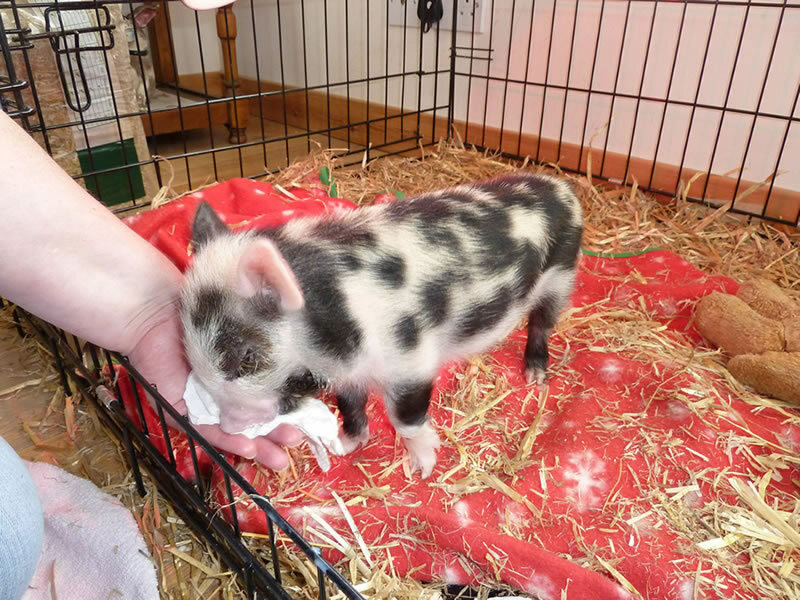 It has been very enjoyable hatching our own chickens and ducks from eggs, and adopting and raising our Kunekune pigs from birth. 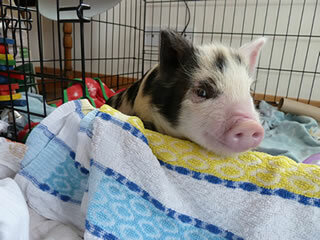 We have three pet pigs, mum Gretel, and two boys – Buddy and Geordie. 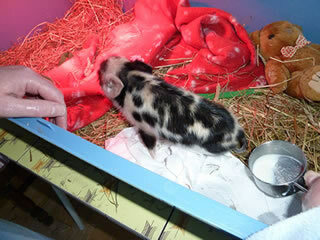 I hope you enjoy seeing our pictures of our animals, and photographs taken of animals on crofts nearby. While we do not have a big enough area of land to keep other livestock, our neighbours do have large crofts of over 100 acres and we get the pleasure of seeing young lambs and cattle, newly born, in the fields surrounding us, and in some cases get to help raise the orphan lambs when our neighbour asks for assistance in looking after them when he is away. 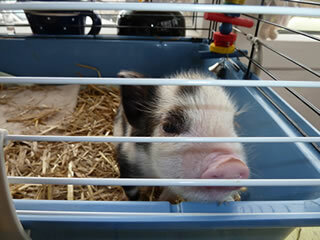 We also do not need to make commercial decisions on sending animals to the market for sale, for meat, or due to old age. If you hanker at living the good life and moving to the Highlands and Islands of Scotland then I hope you will get inspiration for the life from the pictures on our website. The best way is first to visit the areas where you think you would like to live and have a holiday, ideally several holidays at different times of the year including winter, before making the decision to sell up and move to the Scottish Highlands. If you can take several trips to different areas and spend at least a week in each area to see if you like it and the practicalities involved. It can feel romantic staying on a small island off Orkney or in a remote village in the Outer Hebrides until you realise that the nearest supermarket is a ferry boat journey away. Alternatively, that just may be what you want, remoteness does not mean isolation. One benefit of buying a croft or property in the Highlands is that many areas that are not as popular with tourists can provide very good value for money. This may require a rethink on your part. After having holidays in Wester Ross for over 20 years and loving the area we decided due to the low cost of properties to buy in Caithness, an area that has a remoteness and beauty that is distinct in the far north of Scotland, yet not the mountains (nor the midges) found in west coast of Scotland. My advice is to keep your options open and explore the Scottish Highlands and Islands to find an area that suits you, is within budget and has all the facilities nearby that you want or need for your new life in Scotland. You can read more about crofts, crofting and the law relating to crofts on the Crofting Commission website. 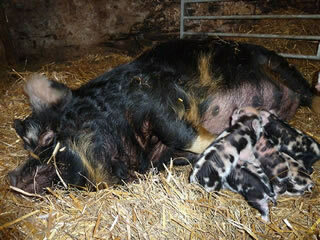 Gretel with her newly born kunekune piglets. 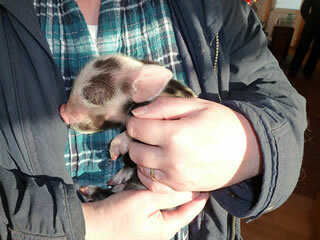 Our pig, Geordie, is being held up to his mum to try and get him to feed. Unfortunately he did not respond to this gentle encouragement by the farmer and had to be hand raised by ourselves. 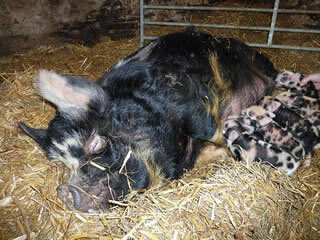 Keeping pigs on the croft was not something we had planned for then one morning our neighbours turned up with a tiny, less than 1 day old, Kunekune piglet. 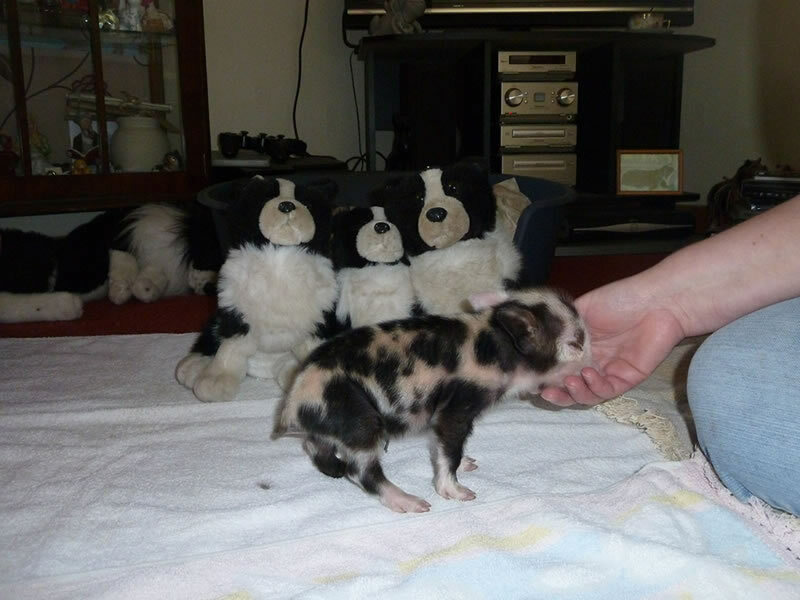 This little one had not got enough strength to feed off his mum being the runt of the litter, either he would be hand raised or left to die. 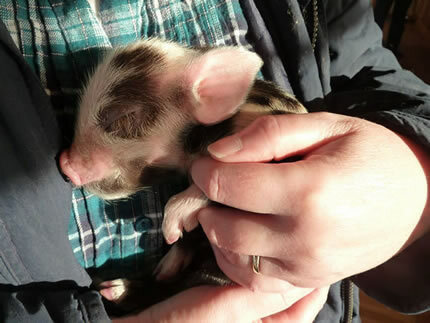 We decided to hand rear him and we called him Geordie after my wife long time friend’s pig that was raised on a smallholding during 1940’s – while the original Geordie ended up in the pot we had no intention of doing this, Geordie was going to be a pet pig on our croft. Eric Macleod looks across the loch at the forlorn wreck of his family's croft. 'How would you like to live there?' he asks his wife Ruth, half joking. After all, they have to think of something to do with the place. But he doesn't expect her instant reply - 'I would love to.' A few short months later, fired by the challenge of an adventure like no other they've known. Eric has given up his promising career in London as an accountant with an international company, and moved to the remote shores of Loch Cairnbawn in the West Highlands. With Ruth and their two little girls, he plans to renovate the croft and make a living from the land. But it's a long leap from management accountant to house builder and crofter - as they soon find out. The MacLeod family's life at Kerracher will fascinate the many people who would love to live such a dream. An accountant by profession, Eric MacLeod, his wife and their two little girls, learn to mix concrete and to build, shear sheep and fish, live with otters and seals. Scotland and the Scottish Highlands for holidays in Scotland. Light Sussex chickens - chicks that we incubated and hatched out from eggs originated in Orkney. 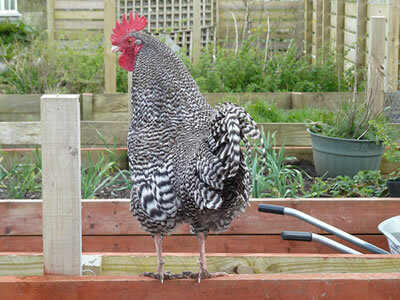 Keeping chickens is fun and it is possible for most people, even if you have a small garden. One thing to remember is that while hens are quiet, cockerel or roosters are not and so you should consider this before taking on any cockerel if you live close to other people. 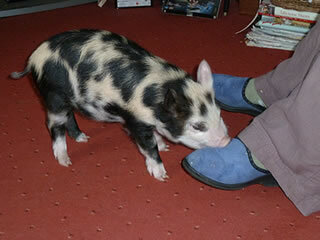 Living in the countryside and having animals that make a noise is just part of the outdoor, countryside scene. You still should be considerate of other people as the noise from a communicative cockerel can travel a fair distance. We bought our first hens within a few months of moving to the Scottish Highlands and we have kept chickens ever since. The hens we purchased were point of lay, in other words they were just about ready to lay their first eggs, and between 18 and 22 weeks of age. They were also hybrids, a breed that has been developed especially to lay eggs, and most hybrids will lay between 40-50 eggs or more a year. In a commercial situation hybrids are usually kept for 18-20 months then replaced with younger hens to continue getting a high number of eggs being laid. Our hens were kept for their eggs and as pets, so we have never killed a hen as they get older, they get to live out their natural lives. 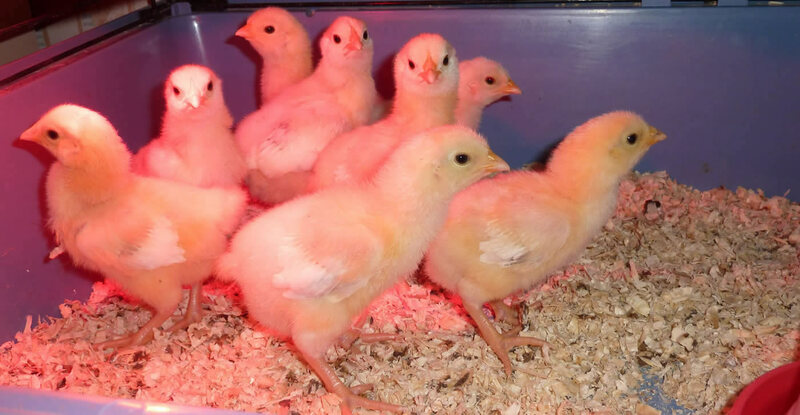 Hybrids can live between 4-6 years of age, so if you plan to keep your chickens as pets you do need to realise that for the last 2-3 years of their lives they will not lay many eggs, and any eggs you do get are a bonus. 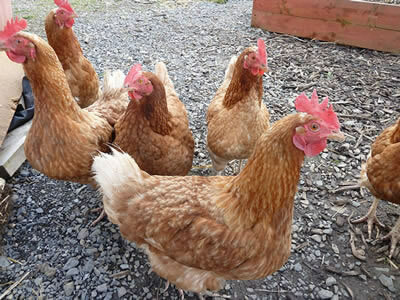 If you are treating you chickens more pragmatically then you may wish to offer your hens for re-homing rather than culling them when they reach the end of their commercial egg laying days, and the people who adopt them will still get the pleasure of keeping hens as pets. Hybrid hens usually lay well until they reach 3-4 years of age and you can expect 3-5 eggs or more each week from an older hen. 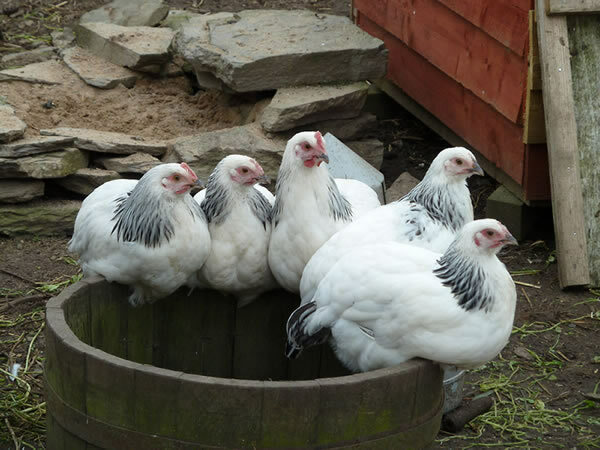 Our Light Sussex hens sitting on a half wooden barrow we used for their dust bath. Having young hens around the croft was wonderful, it brought life to croft, made the place feel like home and it was a delight to go out each morning to feed them and to collect freshly laid eggs. While hens do not need a lot of space it is better if they can be kept in a fenced off area where they have room to roam and display their natural behaviour of pecking and scratching at the soil, where there is an area for dust bathing (they “wash” themselves in dry soil – this helps keep down mites and other pests that can live on a chickens skin and feathers) and an area in the sun to sunbath. You will be amazed at how much pleasure you can get from watching your chickens having a good time – just doing what comes naturally to a chicken. Over the years we have also hatched out our own chicks using an incubator, although you can use a broody hen to do this. 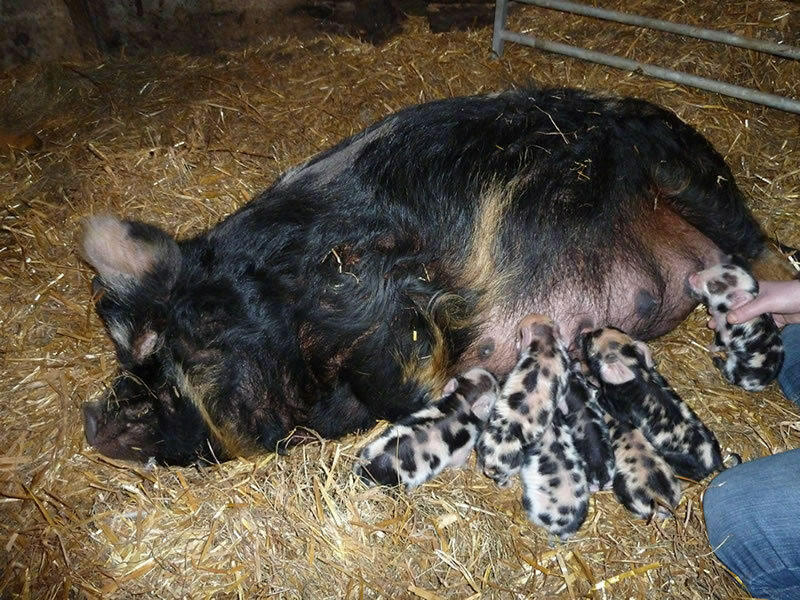 Having hatched out Scots Greys and Light Sussex chickens and watch them grown and mature has been very rewarding and fun. 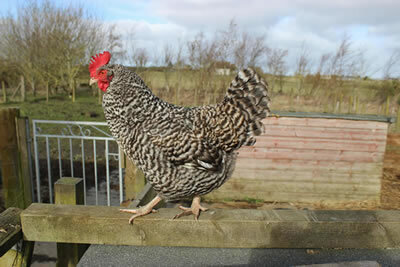 The only problem is that you not only get hens (female chickens) you get males – the noisy trouble making cockerels. While cockerels are wonderful to have there is a few issues you need to consider, one they make a noise in the morning, two – as they mature they can fight with each other and the results can be fairly horrific, looking like out of a chain saw massacre movie. Usually it looks worse than it is, as they tend to bleed quiet freely, they often stop before it gets to a mortal injury. Still it is not nice to watch and you have to wade in and separate two fighting cockerels, which can be a bit of a challenge. I have found that while it is possible to keep a couple of cockerels together with other hens, they do need a fair amount of space so that they can keep out of each other’s road. It all depends on the cockerels involved as some just will not live in peace with another male bird and then you have to make a choice to either re-home one of the cockerels, to separate them into different runs or to kill one for the pot. We have done all three over the years. If you do decide to start keeping chickens, and you want to treat them as pets (i.e. not culling them when they stop laying eggs) then I would suggest you also get into the routine of handling the hens on a weekly basis, this makes it easier for you and the hen(s) when they need to be picked up for medical treatment, or simply to check up that they are healthy. Many people get great pleasure out of holding and talking to their chickens, and some hens will sit on your knee and talk back! While it is lovely going to the kitchen door and finding chickens waiting for a treat, until that is they start a home invasion. 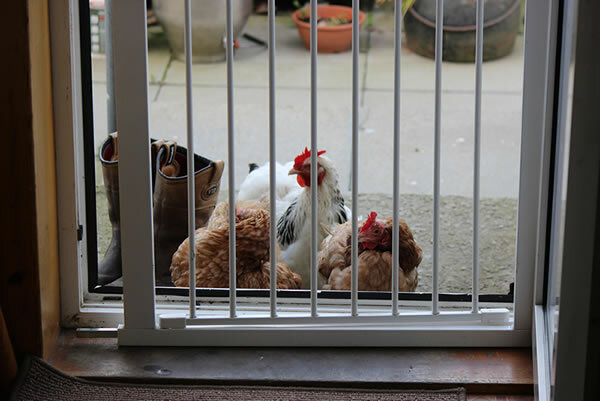 During the warmer months we ended up putting a baby gate in front of the door to keep the chickens out. That is why one of our Scots Greys is called "Oven Ready" as I threatened to put her in the oven for my dinner several times as she was always coming into the house looking for treats - bread or grapes being a favourite treat. Small with plenty of attitude, lay lovely small eggs that are wonderful poached or boiled, and the males like to call out in the evening, you do have to be sensitive to nearby neighbours that may get upset with their noise. 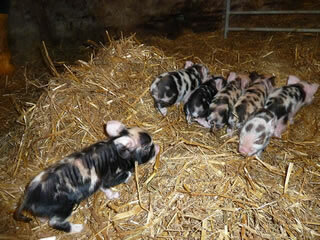 They are easy to feed and keep clean. This is my short nonscientific description of keeping quails. We were given 6 fertile quail eggs by a neighbour and decided try and hatch them out, we were successful with 4 quails hatching, and we later discovered that three were females and one male. While quails have a short commercial life span ours lived for several years and continued to supply us a good number of small eggs for years. 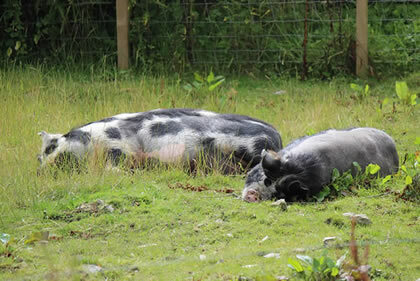 They do not need a lot of space, yet they do love grass to nibble on and as with most animals the better their environment the happier they are. In commercial situations quails are kept in shed where there are often hundreds of the small birds. Our four birds had an outdoor house with a small run that we built ourselves. Inside their house we used sawdust and as it was fairly deep and only about 2 feet high we used a kids fishing net to “fish” out the eggs that they often laid in the back of the house. The eggs are good to eat, often poached, boiled and then shelled (a bit fiddly, yet easy to do with practice), and then sometimes pickled for future use. 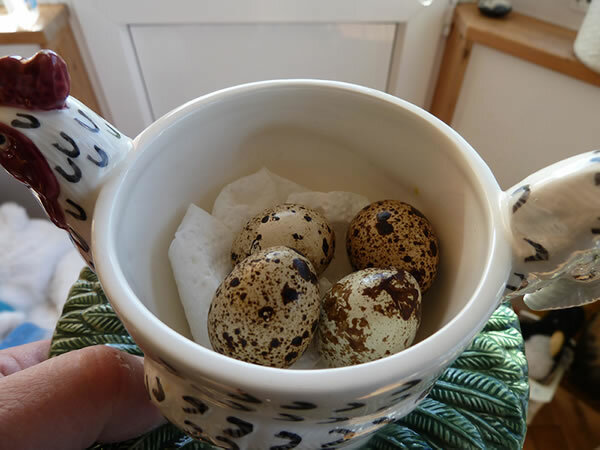 Quail eggs in a cup for size comparison - small but perfectly formed and tasty. 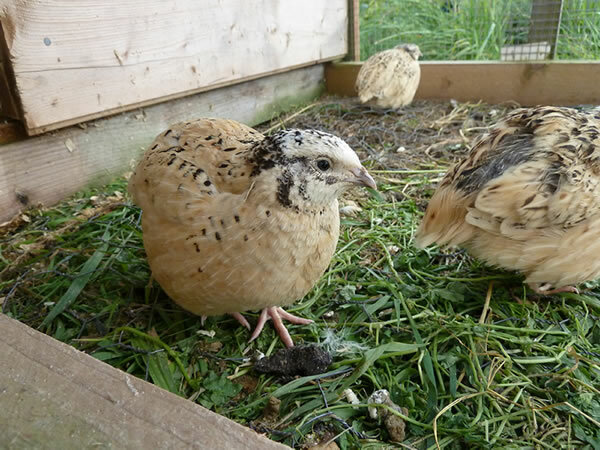 For personal use you will find 2-3 female quails enough to keep a family going as you probably don’t want to eat quail eggs every day. If you have more than this number you will probably need to find a source to sell them to. You will often find friends and neighbours delighted to get presents of quail eggs, or you can arrange to sell them in a local shop or with a nearby hotel. 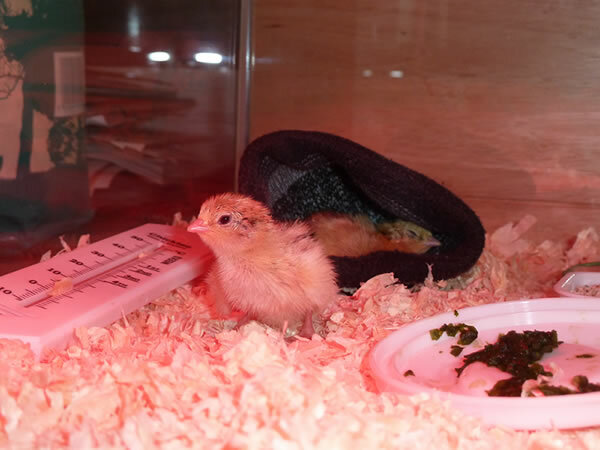 Young, newly hatched quails in a glass tank (fish tank) with heat lamp and one of our woollen hats which they loved to sleep in. Young quails enjoy having an outdoor secure area when they can explore and are kept safe from predators (cats, hawks, rats). 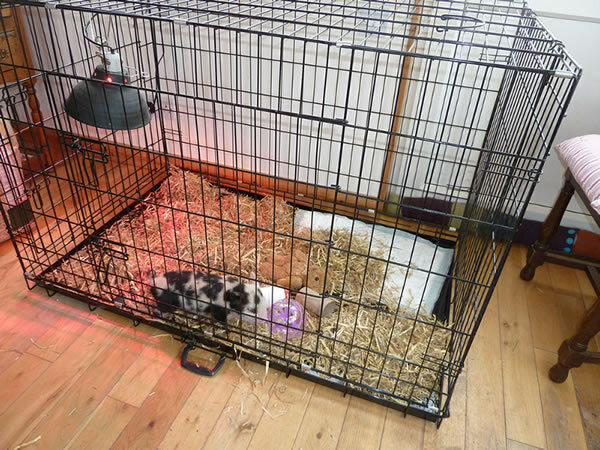 The attached indoor house was dry and waterproof - although they do tend to like staying out in all weathers and only go into their house when it is dark or very cold. Call Ducks on our pond - the drakes seem to like the attention of getting a photograph taken. My wife had mentioned that she loved Call Ducks, so we managed to source a few eggs locally and attempted to hatch them. It turns out that hatching call ducks is a bit more difficult than hatching chicken eggs. Still we managed to hatch out two drakes and one female, who we called Clover, she was very pretty and was definitely adored by the two drakes. 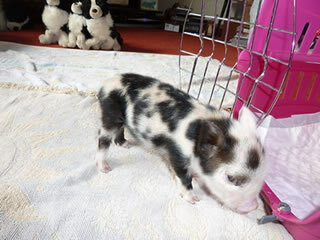 While I worried about her being outnumber by the two drakes she seemed to be quiet happy, anyway I decided that we had to get her company and we went down to the Dingwall Mart when they had their biannual auction for rare breeds, chickens and ducks. I spotted two small, beautiful Call Ducks along with other ones that were being sold singly. The auction was fierce and some of the female Calls went for over £210 each, yes I did say each. This was way above my budget and eventually I managed to bit on the two small Call Ducks that I had noticed earlier and was successful at getting them for £60 for the pair. Sadly there were also male Calls, drakes, that went for around £1 each, as nobody wanted to buy them. The thing to remember is that drakes make for good pets and will adore a small pond or garden giving you hours of entertainment for very little money. They do not even need to have a pond, just a small, shallow area of water in a kids sand pit is fine for them, as long as you change the water regularly. Obviously you will not get eggs from drakes, surprisingly you do not always get a lot of eggs from the ducks either, and they are often little rascals at trying to hide them away from you. 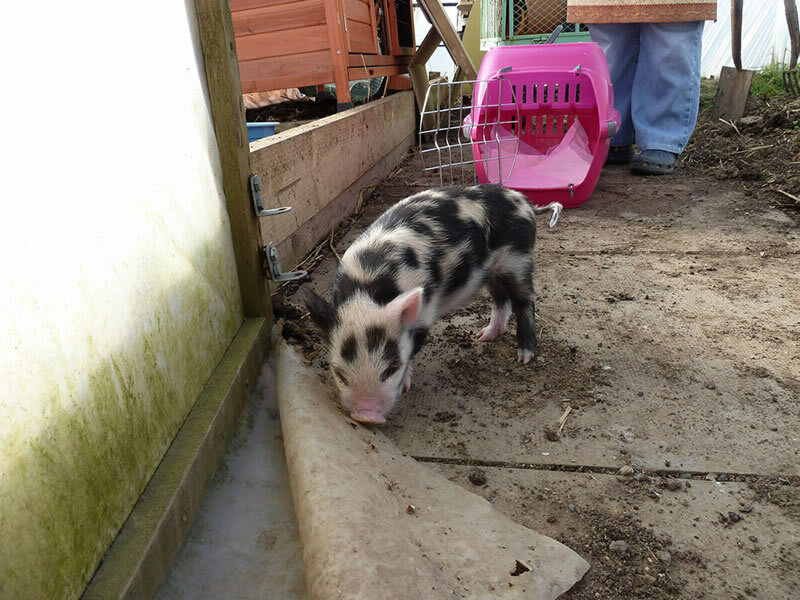 Now I had a plan, I could hatch out call ducks and sell them at the auction and this would help us pay for all the animal feed we were going through, chicken, duck and pig food all add up to well over £120 a month (the pig food especially mounted up with no eggs in return!). So we hatched a batch of our own call duck eggs and low and behold we had more tiny little creatures that loved to paddle and were lots of fun to watch. And all the money I was going to make, well truth be told I was so fond of my little ducks I could not bear to sell them, being worried they would not be looked after well, or foxes would get them, someone would want to eat them, or some other imaginary (yet often true) event. Our little family of 5 Call ducks grew to 16 birds. 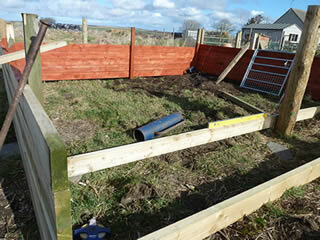 By this time we had also dug out using a small JCB digger a pond for the ducks. 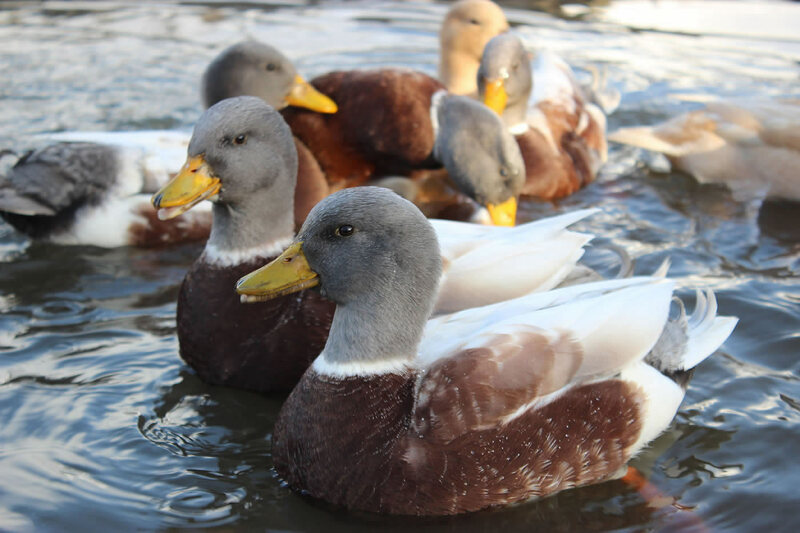 At time of writing we have 14 Call Ducks enjoying the pond and surrounding croft – and I am still broke. 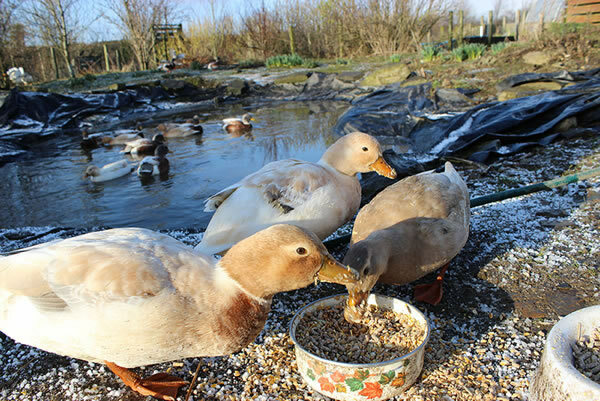 Three of our Call Ducks eating grain and hen food mixture. Wings are clipped to stop them flying away onto the road or countryside. 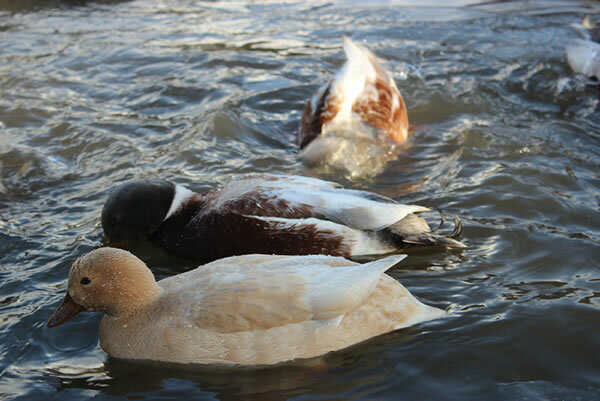 Female Calls are a lighter colour than the far darker coloured drakes, the females vary in colour and size. Goats are a favourite with may smallholders and crofters as they can be used to help clear scrub land prior to cultivation, they will also clean up a field after harvesting. While goats can be kept for their milk, a popular substitute to cow’s milk, and for making cheese, they are also kept for meat. We do not have enough room to keep goats although it is an animal that I would like to have on the croft as a pet, I love how they are very friendly and inquisitive. A friend of ours keeps two goats in her garden in the small orchard area and they have been very good companion animals over many years. If you are contemplating keeping goats either as part of being self-sufficient or you just adore them for their intelligence and good looks, then you must make sure that you have a secure, well fenced area to keep them in, goats are notorious escapees and the last thing you want is to find your goats in your neighbours garden or farm eating their plants, or wandering along a road. 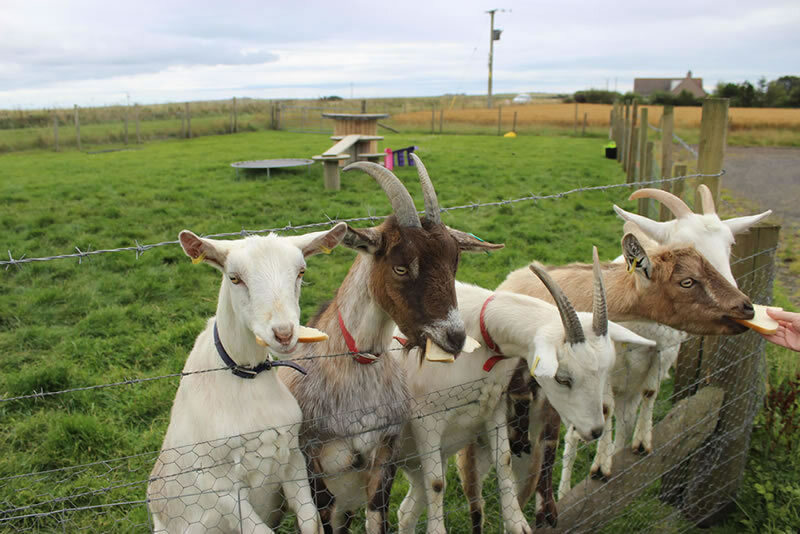 Goats do need space to exercise, they love to play so you need to add features that allow them to climb, jump over and show off their other talents to cause trouble. 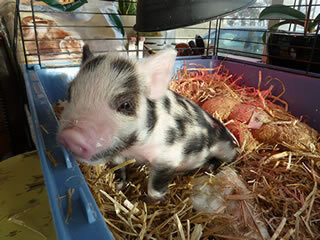 They are adorable, just remember they do cost money to feed, they also require sturdy, waterproof housing that can withstand goats trying to eat what it is made from along with a regular source of straw for bedding. 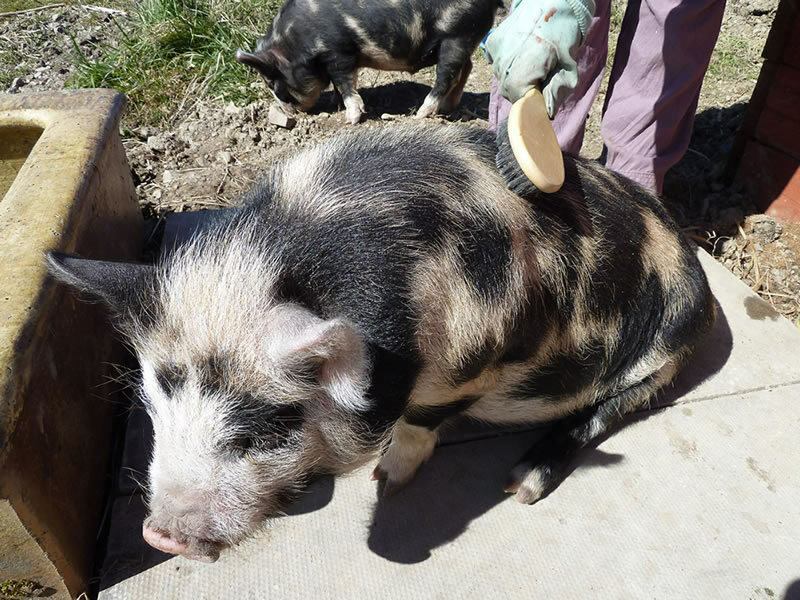 After dealing with the practicalities of having enough space, correct housing and feeding you also need to have the time to look after them, cleaning out their houses, and spending time with them as they love getting attention - especially if you also have treats for them to eat – bread, apples and other fruit go down well. Keeping goats as pets will also require a long term commitment on your behalf to look after them for many years as they do live to a fair age. Goats are wonderful animals and do make great pets if you have the correct outdoor space to keep them. 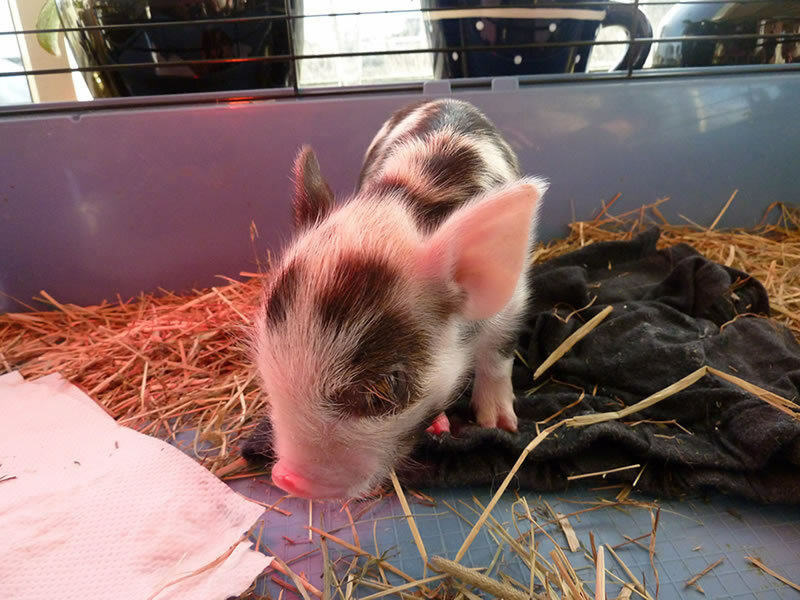 Similar to other farm animals they require to be registered with the appropriate authorities depending on your country and location, and with your vet. Before you go too far down the line of buying goats (it is better to have more than one as they benefit from company) it is well worth buying a couple of books on keeping goats (pets or not) and to visit a local breeder to discuss with them the best type of breed to purchase, and also to see them before committing to keeping pigs on your smallholding, croft or large garden. 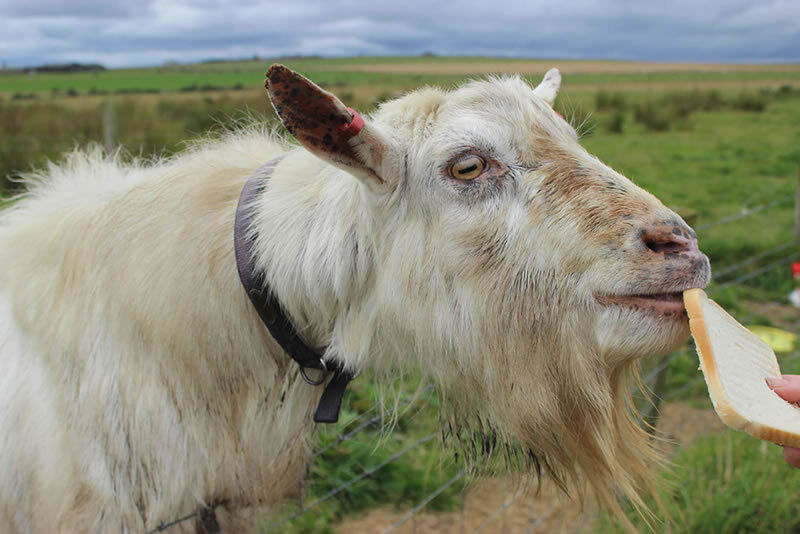 If you are fully committed to keeping pets as goats then you may want to consider adopting / rescuing goats from an animal sanctuary, or look online at the RSPCA / Scottish SPCA website and see if they have any animals looking to be rehomed. You can also contact them to let them know you are wanting to rehome goats. 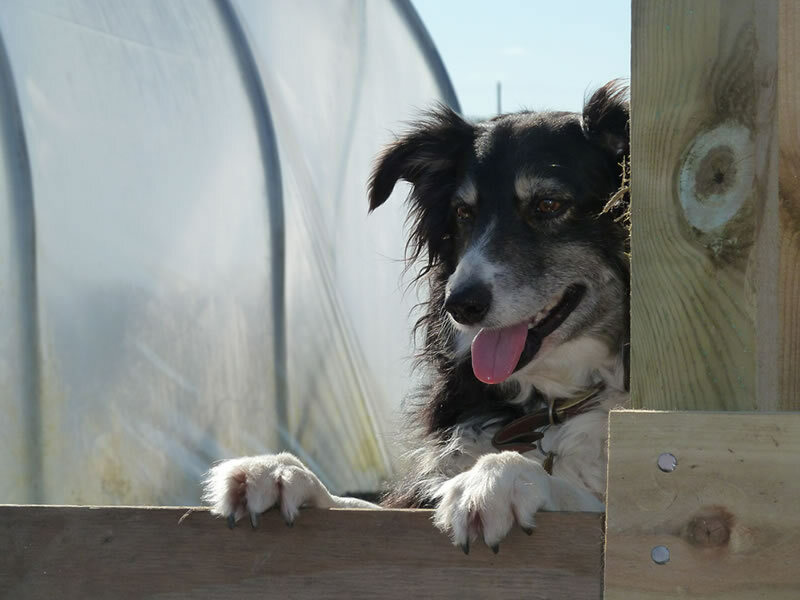 If you plan to keep goats for milk / meat on your smallholding, farm or croft then buying from a reputable professional breeder is the best way to go, or from a farm livestock auction if you have experience in livestock, or you can take someone with you that has this expertise. We have taken great pleasure in the effort to improve our little plot of paradise by planting the boundary area with trees, with over 400 trees planted over the years, most were planted in the first two years and are now well over 6 metres high. 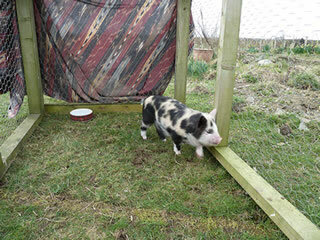 By doing this we have increased the diversity of wildlife, especially insects and birds, that cohabit our croft. We also have a healthy breeding colony of bats that visit us each spring to raise another batch of young, the bats constantly amuse and fascinate us while they fly around hunting for insects in the early dusk and during the evening. As the bats live in our wall space of our living room (not an ideal location) they also entertain us by their constant chattering amongst each other as they raise their young. Don’t be alarmed they do not make too much noise and they have only accidently come into our home on two occasions over the last 10 years. On both occasions I managed to carefully catch and release the bat – making sure I was wearing thick gardening gloves to protect me, and a towel to protect the bat from being harmed. The trees we planted are all native species to encourage insects to feed off the flowers and leaves, this in turn attract the birds and bats to the croft. In just over 10 years we now have a healthy living windbreak that gives us a visual and wind shelter, making our little croft a lot more private and enjoyable place to work and live in. While travelling around the area where we live it is a welcoming site to see wildlife sharing the croft and farm land in the countryside and along the coast. It is so important for all of us to contribute to preserving the natural world and farmers and crofters have such an important part to play in this, along with government support through environmental agencies. Sheep are kept on many Scottish crofts as they are very hardy animals that are capable of living outdoors in the Highlands of Scotland for most, if not all of the year. Why keep sheep? 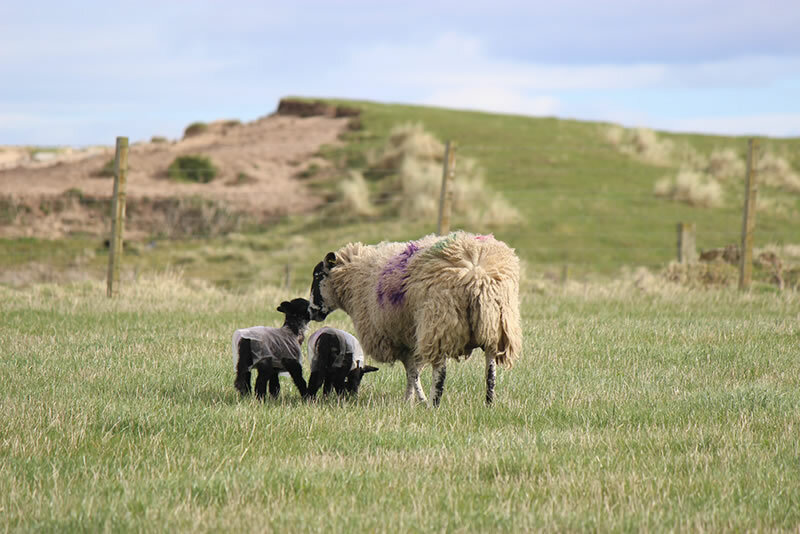 I am sure many a farmer / crofter has asked this same question and it comes down to a number of factors, one of the reasons being is that sheep will thrive in the often harsh environments found in the Scottish Highlands and Islands. They are also used to produce spring lambs for meat, and sheep can also kept for their fleece. NOAH Compendium - NOAH (the National Office of Animal Health) represents the UK animal medicine industry: their aim is to promote the benefits of safe, effective, quality medicines for the health and welfare of all animals. Crofters Commission - learn about the legal and support services provided by the crofters commission. Registering a croft or common grazings with the Registers of Scotland. This authority also has a very useful guide to preparing a croft plan. 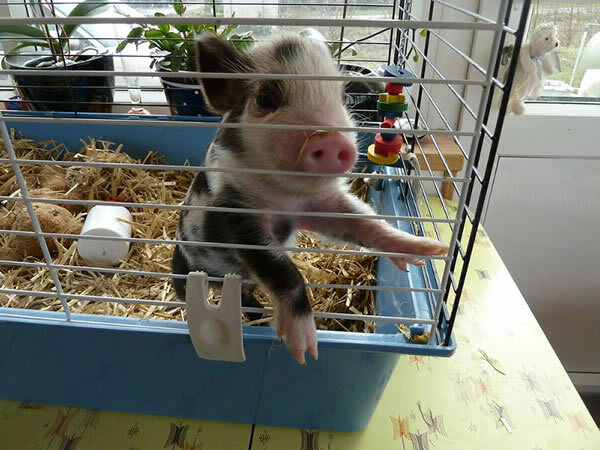 Legislation and requirements regarding keeping pigs, sheep and goats - UK Gov Site. Our other websites : Pictures of Swans ~ Gairloch ~ Scotland ~ Visit and Travel ~ Caithness and Sutherland ~ Design Counts for Website design and hosting.